‘Lock Cromwell in a deep dungeon in the morning,’ says Thomas More, ‘and when you come back that night he’ll be sitting on a plush cushion eating larks’ tongues, and all the gaolers will owe him money.’England, the 1520s. Henry VIII is on the throne, but has no heir. Cardinal Wolsey is his chief advisor, charged with securing the divorce the pope refuses to grant. Into this atmosphere of distrust and need comes Thomas Cromwell, first as Wolsey’s clerk, and later his successor.Cromwell is a wholly original man: the son of a brutal blacksmith, a political genius, a briber, a charmer, a bully, a man with a delicate and deadly expertise in manipulating people and events. Ruthless in pursuit of his own interests, he is as ambitious in his wider politics as he is for himself. His reforming agenda is carried out in the grip of a self-interested parliament and a king who fluctuates between romantic passions and murderous rages. 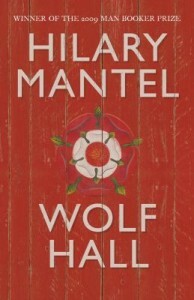 From one of our finest living writers, Wolf Hall is that very rare thing: a truly great English novel, one that explores the intersection of individual psychology and wider politics. With a vast array of characters, and richly overflowing with incident, it peels back history to show us Tudor England as a half-made society, moulding itself with great passion and suffering and courage. Very involved so many characters on time line. Needed to refer to timeline to often. Complicated and daunting. Enjoyed the complexity, but was put off by none of the characters acting with integrity. Did’nt finish it found it more of the same. Very gripping, quite a lot of humour. Element of spying on one another which kept my interest. Found the court activities, the maipulation, etc very engaging. Loved the description of Cromwell’s home. When i realised that I was only just perserving with the novel, i ceased reading it. Cromwell is portrayed as an amazing character. A good book, will encourage the reader to research more of the topic and this book did this for me. This entry was posted in Awards & Prize Lists, Fiction, Historical Fiction, Recommended Reading and tagged Author, Book Club, book review, Literary Awards, Parramatta City Library, reading by admin. Bookmark the permalink.